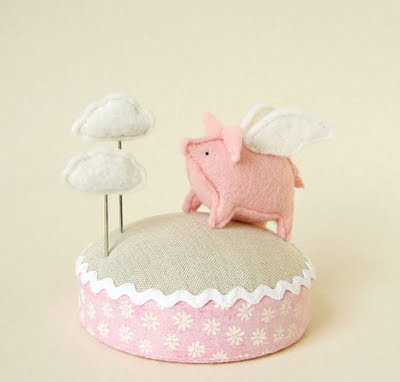 Pin A Cloud On Me! Kittens, I've gone a little crazy lately. Don't worry. It's the good kind of crazy. Unless you're my pocketbook, that is. I've been making some tentative plans for my summer sewing, which means I've been buying all sorts of fun sewing accoutrements: fabric, patterns, vintage patterns (! ), button-making kits, and pin-cushions. Once I start matching fabric and patterns, I'll share those, but today is all about sawdust and pins. Y'all, my new pin-cushions are so adorable I'm having a hard time sticking things in them. They'll get holes! How could I be so mean to them? First up is this lovely little wrist pin-cushion from A Fashionable Stitch. I'm horrible a putting pins back into cushions while I'm actually using my machine. Normally, I just chunk them in this little metal sewing box, where I keep my not-in-use pins. This is fabulous, unless you accidentally drop one on the floor...which happens way too often. So, this wrist cushion is a dream come true! I used it last night for the first time and loved it. Not only is it a delightfully girly color combination, but it's so convenient. I may never sew without it again! My other cushion purchase is totally, ridiculously frivolous. I've lusted after the whimsical cushions from LifePieces for eons, but I've managed to resist the temptation. 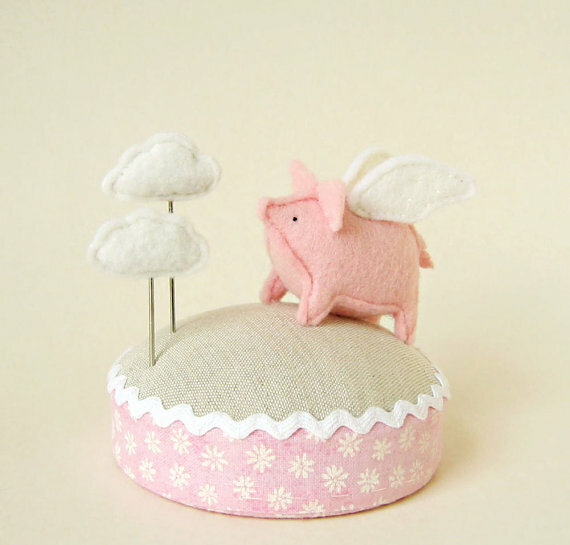 However, once this little flying pig popped up in their store, I was a goner. Just look at those cloud pins! It even came with it's own coordinating, handmade flying pig drawstring bag. Let's be honest, friends, this one actually may be too cute to stab repeatedly with sharp bits of metal. But it will make me smile, sitting on my sewing table, at least! Have you made any fun sewing purchases lately? Any patterns or cushions or truly lovely fabric finds? Not going to lie, I also have my eye on one of Sunni's pressing tool sets. After all, my cushions need coordinating friends, don't you think? This week, finally finished with finals and deadlines, I dove into my stash of new patterns. 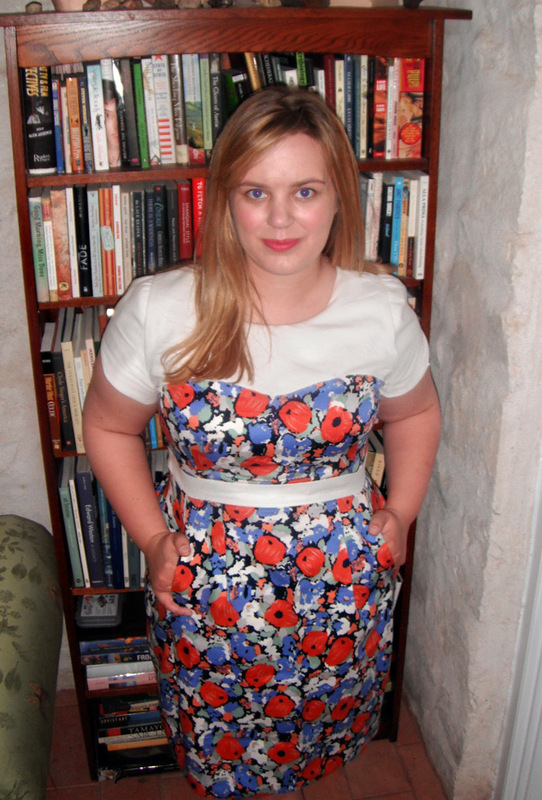 For my first official garment of summer, I settled on one of Colette Patterns newest offerings: the Ginger skirt. 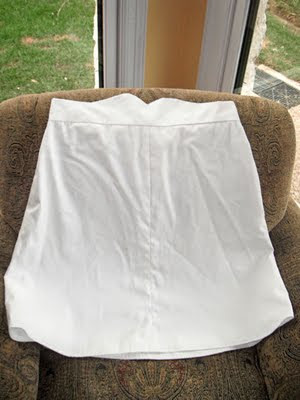 The design is a simple A-line skirt with some waistband variations. At first I was reticent to shell out $16 on such an easy pattern, but the photos were so cute! The bias-cut striped version especially held divine shades of Kate Spade. Visions of lovely, summery skirts filled my mind and I gave into temptation. After all, my wardrobe is decidedly lacking in A-line skirts. As it turns out, there's a reason for that. They look dreadful on me. Apparently when one has hips the size of small principalities, a skirt that's all angles just doesn't flatter. It's so unflattering, in fact, that I'm not even bothering to hem the thing and treat it as a laundry day skirt. I'm also not posting pictures of me in it for the internet to save in its infinite memory. The last thing I need is to be Googled by a cute Irish golfer, only to have that monstrosity show up. 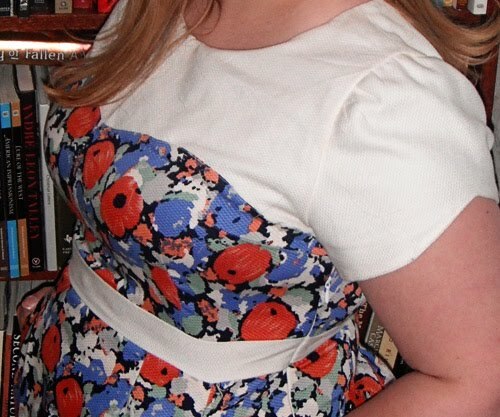 Suffice it to say: I looked like an ice-cream-cone-shaped twill-covered whale. The part of Mary the Blonde Sewist will today be played by a chair, instead. 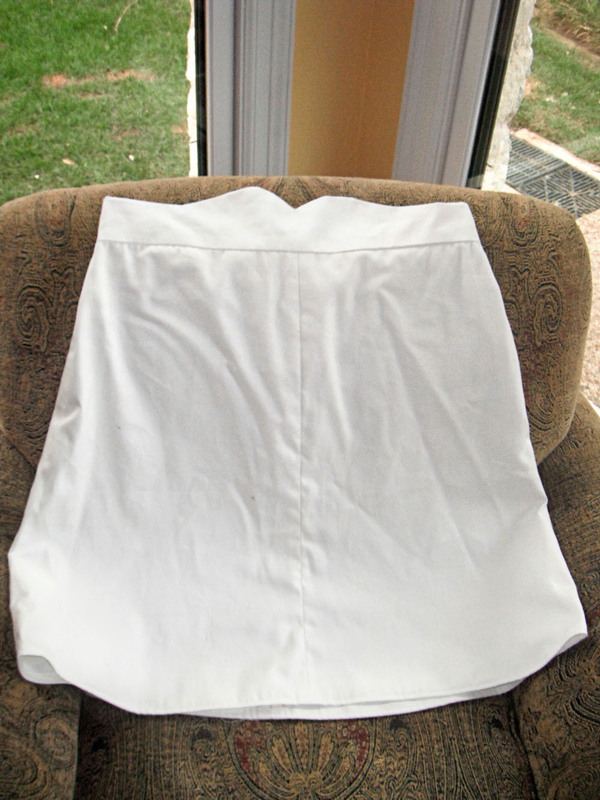 I chose version 2, with the curved waistband, and made it up in a white cotton twill from JoAnn's. (I can't even tell you how thrilled I am that I didn't waste special fabric!) All in all, construction - without hemming - took about 2 hours. This is one quick pattern! Sarai from Colette Patterns specified that she designed both new patterns, Ginger and Violet, for beginners and it's obvious from the directions. Throughout the envelope, there are more helpful tips and definitions than usually found in Colette patterns. If the fit had worked out, this would have been a go-to pattern, just from the ease of construction itself. Nothing! Unless you count not finishing the hem or the inner waistband, after the shock of trying the skirt on. Everything! Well, everything fit-wise anyway. The major problem was that the skirt waistband hit me above my natural waist, which is not a good look for an hourglass shape. Visually, it rather merged my waist and hips area. Were I trying it again, I may go up a few sizes, so the skirt would sit closer to my hips than The Girls. Make a muslin! Or, my preferred option: use fabric you're not attached to for a wearable muslin. 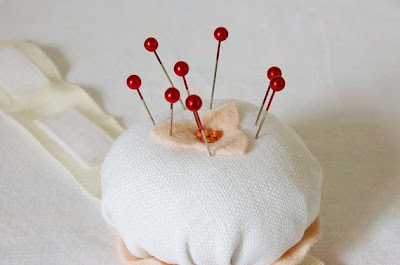 When inserting the inner waistband, follow the directions implicitly. Sarai's not lying when she says the instructions are counter-intuitive, but you will be rewarded with a fantastic finish, I promise. White cotton twill from JoAnn's, on sale for $5/yard. This really is a great pattern, even if it didn't work for me. I actually highly recommend it, if only for the instructions on putting in an invisible zipper into a skirt with a waistband. Their technique is one I haven't run across, but that I'll be using from here on out. It makes a much cleaner finish that what I've been doing. Plus, if A-line is your thing, this skirt is lovely - easy to sew, great directions, and endless room for embellishment. Sunni, from A Fashionable Stitch, has already sewn up a delightful version and is hosting a sew-along for beginners using the pattern. I know I'll be looking at the sew-along Flickr group with envy, once people start posting pictures! For now, I'm tempering my woes with chocolate and - of course - other patterns. 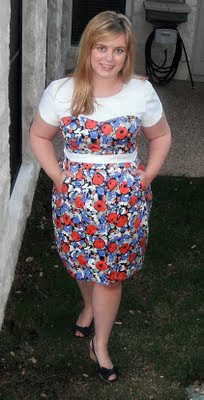 Those summer skirts are still haunting me, but this time I'm trying a pattern with a more flattering shape for my body. Friends, what was your last pattern disaster? Did you have vintage dress go awry or a coat pattern that ended up being a sewist's worst nightmare? Hello, kittens! Sorry for the radio silence around here. Did you know that making sewing plans when you have finals and a looming book deadline is futile? I wish I'd gotten that memo. For the last two weeks, I've stared longingly at my sewing table, wishing I were pleating a skirt instead of re-memorizing the location of the pudendal nerve. Thankfully, my schedule is wide open for the next few months. I'm positively gleeful thinking about all the projects I can finish! First up on that (very) long list was my lonesome Colette Macaron. Y'all, I don't know why it took me so long to get to this dress. It is so cute! This may actually be my favorite dress I've ever sewn. The reason for this love lies in the fit. If you're an hourglass shape and haven't sewn this pattern, please go buy a copy! You will not be disappointed. The combination of the tulip skirt and fitted waistband makes for a divine shape. My waist looks infinitesimally small in this. Who doesn't love that? Even better, putting this dress together was relatively painless. The skirt is symmetrically pleated, with pockets hidden in the outside front pleats, while the bodice is four parts - faux-sweetheart neckline, contrast top, contrast waistband, and sleeves. It sounds like a lot of detailing, but Colette's instructions are thorough and easy-to-follow. The trickiest part was attaching the bodice pieces to one another. If left to my own devices, I would have done the traditional Put right sides together and stitch! method. However, Colette's instructions instead have you fold a hem on the sweetheart piece, then edge stitch it to the contrast piece. While a little more labor-intensive, this does prevent the sweetheart piece from becoming uneven. Another thing to rave about on the Macaron is the sleeve design. The shaped sleeves not only add visual interest, but may be the most comfortable sleeve shape I've worn. I may add these to a few other non-Macaron dresses in the future. They're both easy and adorable - a perfect combination. Overall, this is a fantastic pattern. With my summer sewing plans forming, I'm already envisioning a few more iterations of this dress. With the two fabric combination, it's going to be great for using up stash fabrics that I only have a bit of. Plus - come on! - how could I sew just one of a dress that looks this cute? Substituted a lining for the neckline facings. The last time I used this white pique, the facings were visible on the outside of my garment. Keeping that in mind, I opted for lining the upper Macaron bodice. I made doubles of the two contrast pieces and treated them as a traditional lining, which I catch-stitched to the inside, covering the seams. Not only did it get rid of facings, but the finish is much neater! Switch out the invisible zipper for a traditional one. With really fitted bodices, I find invisible zippers to be a bit flimsy. There are probably better quality ones than Coats & Clark, but I'm limited to what's on hand at JoAnn's, which always feel like they're about to break without a lot of ease. I love the fit of this bodice, but it is a bit tricky to zip up, so traditional zip it is! Attaching the bodice pieces together is a bit difficult, as I mentioned above. Have a tailors chalk or maker on hand to mark the seam allowances and you'll find it much easier! Don't be afraid of the pockets. The idea of inserting pockets into pleats sounds complicated, but if you follow the Colette directions, it will be a breeze. My only advice is to be very careful when slashing your skirt piece - it would be very easy to get overzealous and cut too deep. Shell: Italian poppy print pique from Satin Moon Fabrics in San Francisco. Contrast: White pique from Hancock Fabrics. It's that dreaded time of year again. You know the one, filled with poorly lit dressing rooms and highly unflattering swaths of spandex: swimsuit season. I hate shopping for swimsuits. Even when I was a minuscule size six (which is around the size I start looking like Skeletor, as my body is just sadly not made that way), it was pure torture. I glowered at tiny yellow polka-dot bikinis, wishing we still wore bathing dresses. Whenever I watch Gidget, furious envy overtakes me at Sandra Dee's cute swimsuits that actually cover and - gasp! - flatter things. This season, I'm not taking any - pardon - crap from swimwear. Over the course of my almost-a-year (!!) of sewing, the biggest lesson learned is that I'm in control of my wardrobe. Making your own clothes means you're not at the mercy of chain stores or current trends. It's liberating, not having to settle for something, just because it's the best out there on shelves. So, why should we have to settle when shopping for swimsuits? We shouldn't and I won't. Before you get too excited, I should tell you - I am not sewing my own swimsuit. Yet. 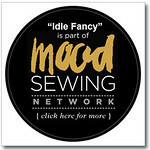 It violates my current sewing mantra of keep things pleasurable, it's a hobby. There's enough hand-wringing and fretting in my two real-life careers, so my creative outlet should be soothing. Can you think of anything less soothing than fitting your own swimsuit? I do not need intimate knowledge of how many precise inches of buttock I have, thank you. Instead, I'm leaving all those fiddly bits up to the experts. Namely, the online ones. Did you know you can buy swimsuits online? Really, really cute retro inspired ones? This is genius, kittens. Not only do we not have to face fluorescent lighting, but a whole world of styles has opened up to us! 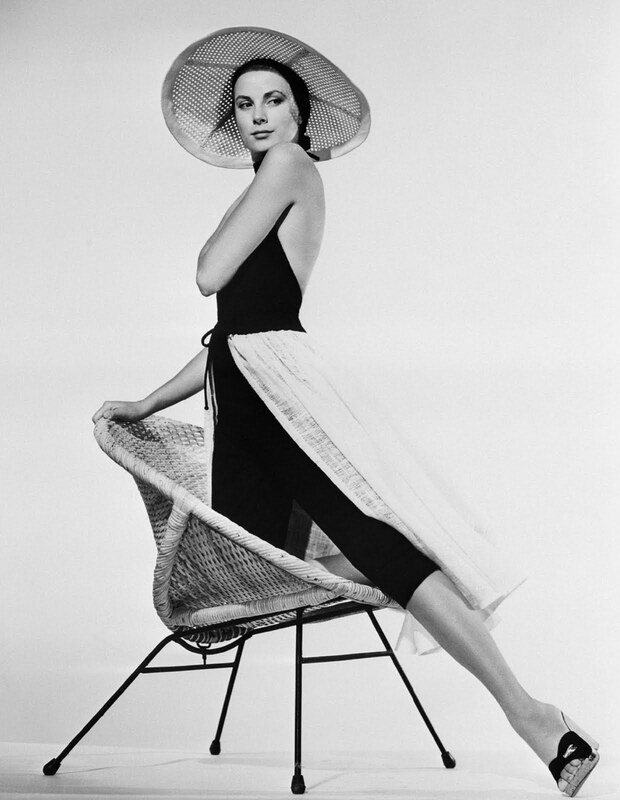 Who wants the same swimsuit everyone else who shops at Nordstrom has, when you can have a suit designed by Esther Williams, the queen of glam swimming? She's just the tip of the iceberg, as I found out last week. 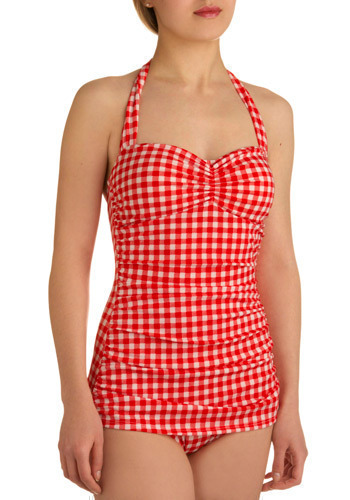 Retro-inspired swimwear falls into fairly delineated categories, all of which are amazing. Let's take an online swim tour, shall we? With such great options, what did I choose? Well, shopping online is tricky, especially for swimwear. So, I went in with strict guidelines on what I needed. Must be a one-piece. In college, I had an emergency appendectomy. Thus, I have a few tiny scars that I'd like to keep out of the sun, for fear of color change. Plus...one pieces are super comfortable. Despite being 25, I choose not to be media pressured into a bikini. Have some structure, especially up top. When running down a beach (or, you know, lounging by the pool), no one wants to worry about wardrobe malfunctions. Nothing too cliched retro. I wanted something pretty, not something kitschy. That ruled out the Sailor and Cherry Pie categories. Y'all, it's pink. It's inspired by Marilyn Monroe. It has a ton of structure. It's pink! Have you ever seen a more perfect swimsuit? It was love at first sight. 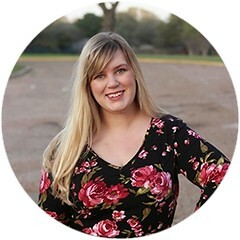 It's designed by Pinup Girl Clothing, one of my favorite online purveyors of retro-inspired clothing. My most beloved ready-to-wear dress is their Heidi dress, which I wore last year to a Very Important So Everyone Dresses Up Publishing Event. I trust their workmanship and sizing implicitly, so ordering online wasn't too terrifying. And the best part? I didn't have to stand in a dressing room. Score! Have you every shopped online for swimwear? What do you look for in a swimsuit, retro or otherwise?